The Palestine Liberation Organisation's executive committee has backed early elections to end the deadlock over forming a national unity government. The Hamas group, in power since winning January's parliamentary polls, reacted by condemning the suggestion. PLO officials said after meeting President Mahmoud Abbas that he would have their support for early polls. The Palestinian Authority has been under a Western financial boycott since Hamas's victory. Mr Abbas is expected to announce his decision in the coming week. Speaking to the BBC, one of his top officials said he believed the president was minded to call parliamentary and presidential polls. "The status quo cannot be continued - it is a disaster on the Palestinians," said Saeb Erekat. 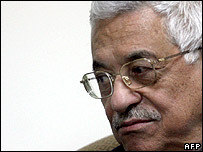 Palestinians, he added, had to choose between the approach of Mr Abbas and his Fatah faction and that of Hamas. The current Hamas-led administration has been denied direct Western aid because it refuses to renounce violence, recognise Israel or accept previous Israeli-Palestinian agreements. Palestinian Prime Minister Ismail Haniya condemned the idea of early elections, saying they would accentuate "crisis and tensions". "I think that the invitation to carry out the elections in this way is disrespectful to the Palestinian people," he told Iranian television, in an interview dubbed into Persian. A Hamas spokesman in Ramallah, Ismail Rudwan, described the PLO committee's statement as a threat to democracy. "We will not allow any coup against this government," he was quoted as saying by Reuters news agency. Izzat al-Rishq, a member of Hamas's exiled leadership, said the group would not mind a new presidential ballot but opposed new parliamentary elections.